BEWARE OF CHEAP TAIWAN KNOCK-OFF COPY FILTERS! American Dirt Bike has been contacted by a company back east about buying cheap copy stainless steel oil filters. They claim they are the same as K&P filters but don't even come close in performance. 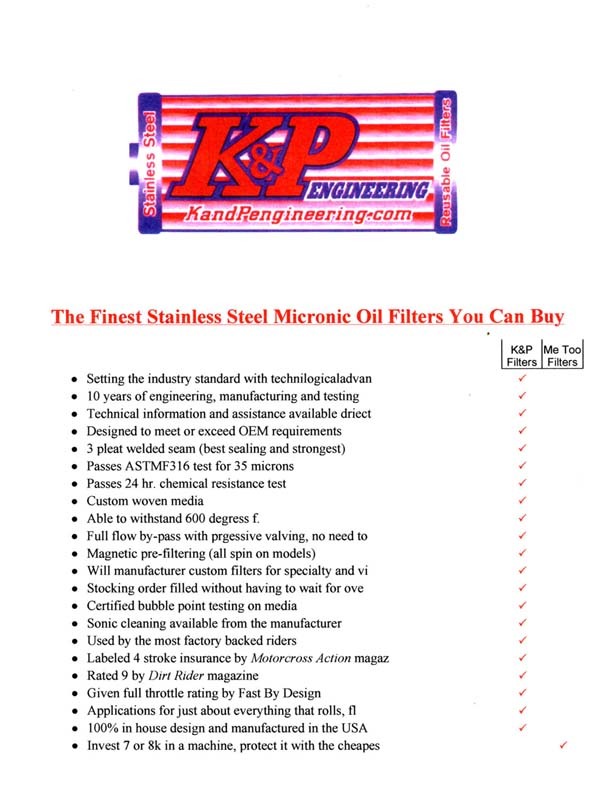 We have used K&P stainless steel filters since 1995 and we have never had a problem. They have had years of continuous engineering development and testing applied to them and manufactured right here is the USA. Get the best there is. Choose only genuine K&P stainless steel reusable oil filters if you care for the life of your engine. You really do get what you pay for! !